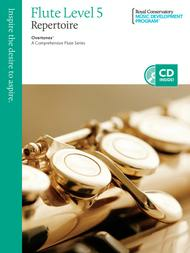 Overtones: A Comprehensive Flute Series serves as the official resource for flute assessments of the Royal Conservatory Music Development Program. This progressive collection includes fundamental repertoire and supporting materials such as Etudes, Compact Disks, Orchestral Excerpts, and Technique. The richness of music carefully selected for this compilation will resonate with teachers and students at every level of study. This compilation of standard orchestral passages for flute is an indispensable resource for the developing years and beyond. Teachers and students will find this unrivalled volume essential for assessment or audition preparation. Unparalleled in scope, Overtones offers all the music flutists want in one complete series! This progressive collection includes fundamental Repertoire and supporting materials such as Etudes, Compact Discs, Orchestral Excerpts, and Technique. The richness of music carefully selected for this compilation will resonate with teachers and students at every level of study and is the official series for those using The Royal Conservatory Music Development program.